Banjo and poly premier aren’t the only fabrics that display well on a pipe set up. Quilters often use uprights and drape supports to show off their works of art at quilt shows. After you take your décor off of your door for the holiday season, how do you store them without them going flat? Keep them hanging all year long on a drape support. They can be stacked close to one another to take up the least amount of space while staying fluffed out and looking good. If you ever run out of party games grab part of your pipe and drape set up and blast some Caribbean music. No one wants to see boarded up windows or power tools laying around. 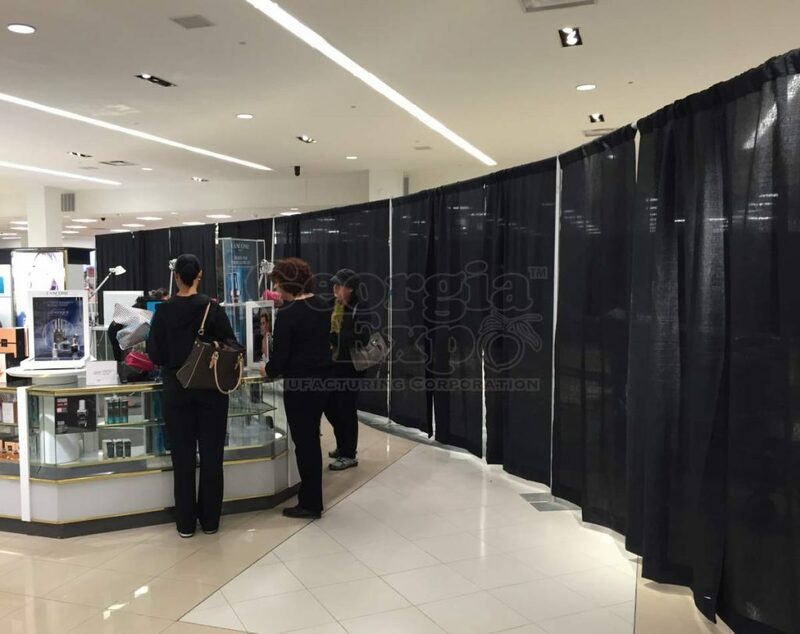 The solution to that is to hide retail space renovations with some beautiful drape walls you can pop up whenever you need. 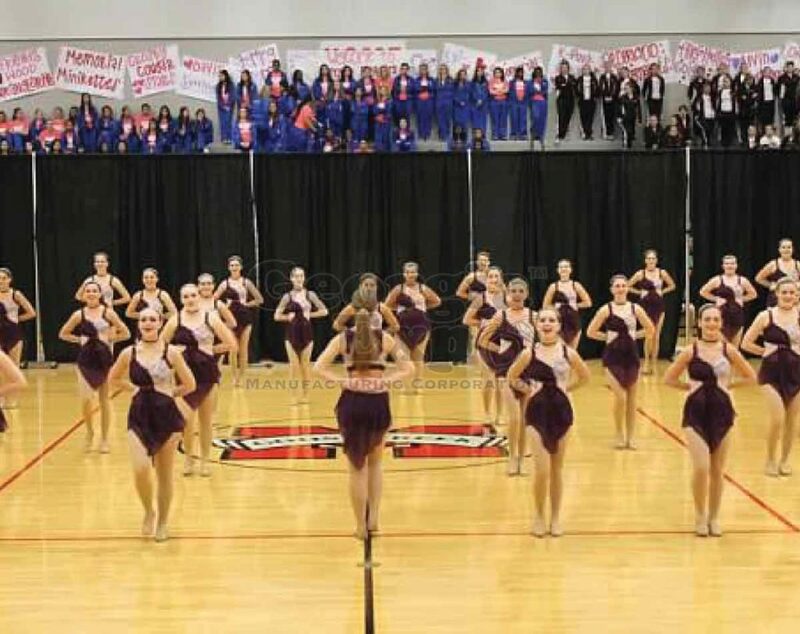 When you’re standing in front of a crowd that last thing you want is for your audience to be looking at whatever is behind you. Make sure your background is a solid color, like gray or blue, for maximum attention. Guiding people where to go can be a full-time job. Give that job to some 3-foot drape walls. If there’s one day that needs to be perfect, it’s your wedding day. 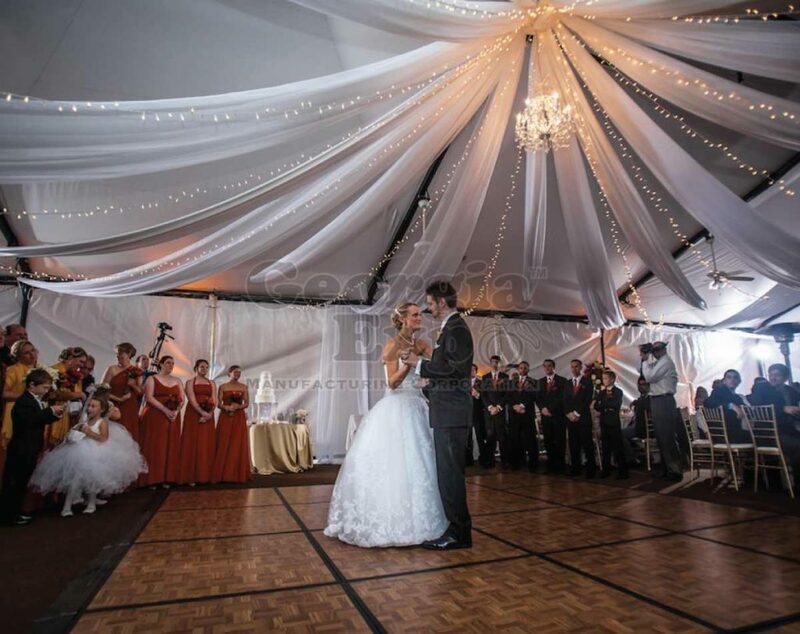 Keep your venue looking elegant from any angle by putting up some pipe and drape. 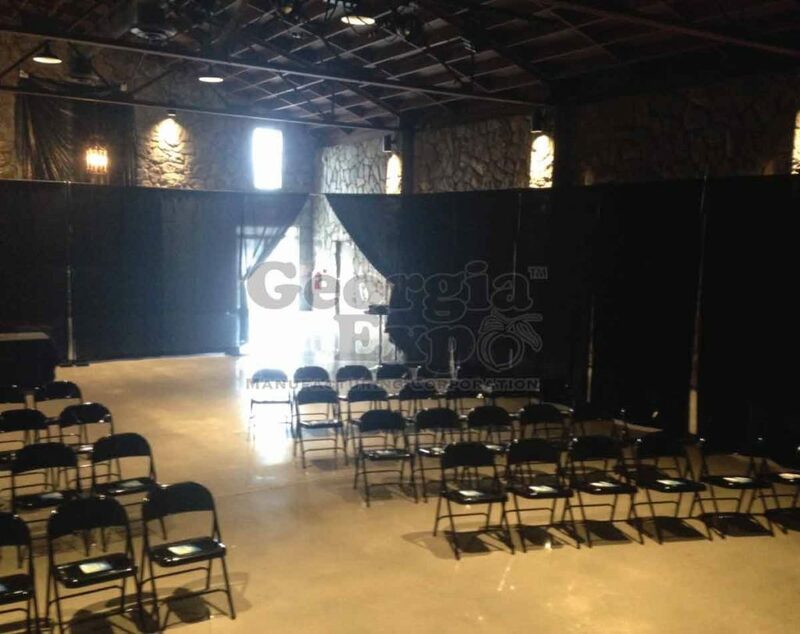 It can also be used to close off a large room for the ceremony then open it up for the reception. Want to look like you are in a flower field or on top of a skyscraper without ever leaving the indoors? Take a picture in front of a printed photo backdrop held up by pipe. Have a window that’s letting in too much light for certain events or times of day and cramping your event mood – block it out with blackout drapes. 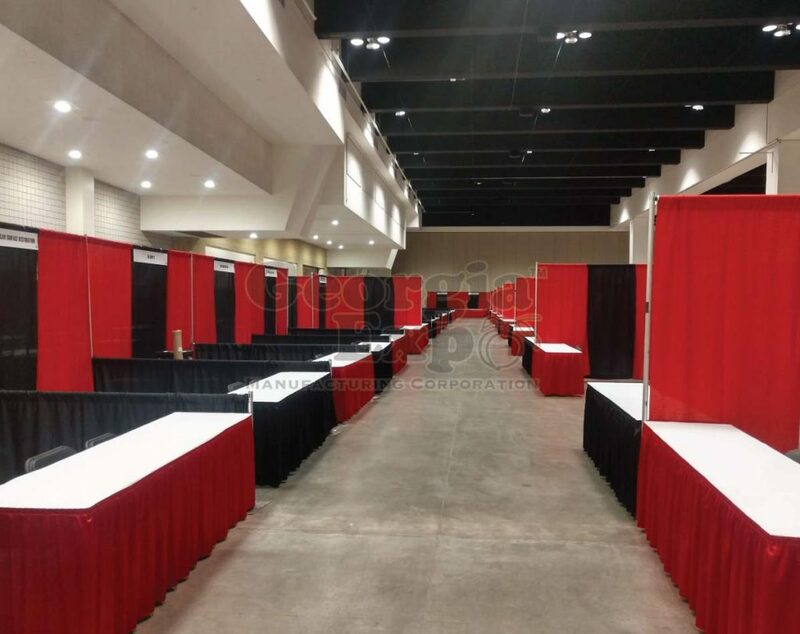 Pipe and drape isn’t only for trade shows; it can also be used to make private rooms used for changing rooms in a temporary or permanent space. 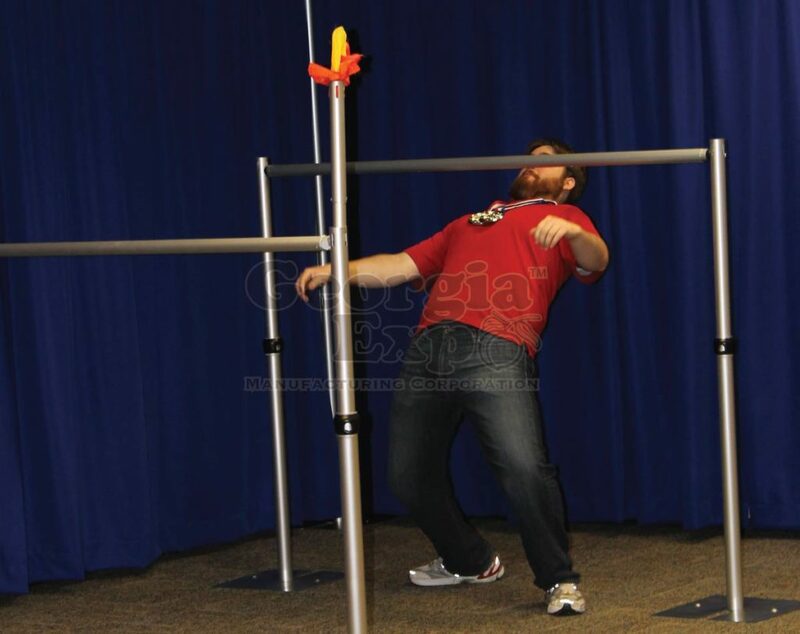 These are popular for dance competitions, sporting events and even as temporary nursing stations. Pipe and drape was made to be easily put up and taken down. You can make private voting areas to stay up for a few days at a time, dividing a big open space into usable bits. Impress everyone at your next party by creating an elaborate maze anywhere! With the height availability of our uprights, none of your visitors will be able to see over it and find their way out without exploring the whole thing. 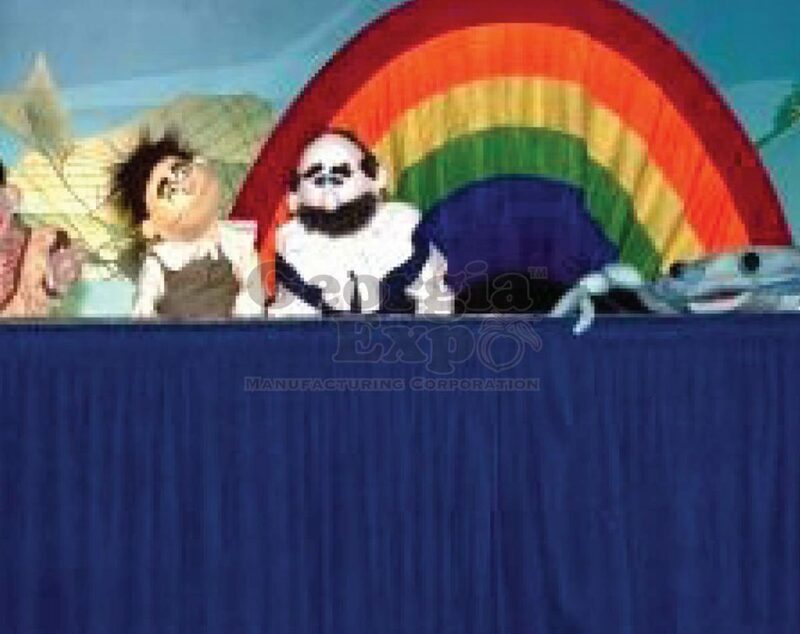 Anything that includes a stage needs pipe and drape. Create a hidden area behind the stage area with just a few segments or use the pipe and drape as a grand entrance for the dancers. Making sure everyone stays in their lanes while wielding a bow and arrow is half the battle. Make sure there is no question where the safe areas are by marking them with 3-foot pipe and drape walls. This is the most classic use of pipe and drape. If you’ve ever been to a trade show, you have undoubtedly seen a booth made of pipe and drape. With the vibrant colors our drape comes in, they are perfect for matching your VBS theme or keeping the attention of children at a puppet show. It is easy to put up and take down, so it’s great for spaces that are used for multiple purposes. Even your ceiling can be pretty if you put drape over it. Give your event an interment, whimsical feeling by adding some swag from above. The best thing about pipe and drape is how versatile it is. You can use it to hide any storage space you don’t want to be visible and instantly make it look more appealing. You can even print your logo on drape to display at your trade show or place of work to further advertise what you do. It is lightweight with maximum visual impact. 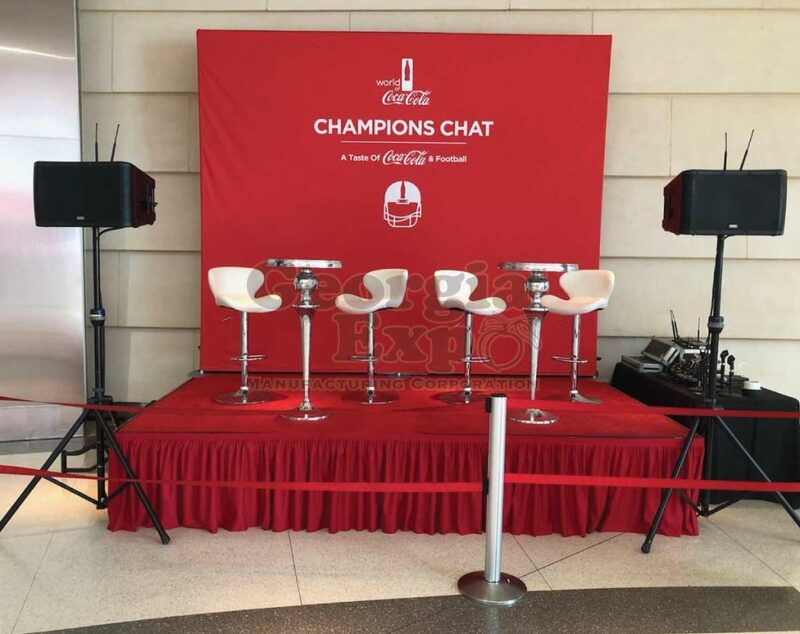 Include some ad space or make your fencing more attractive at an event by covering it in some printed drape. It’s lightweight, affordable and easy to wash, making it perfect for livestock events. 21. 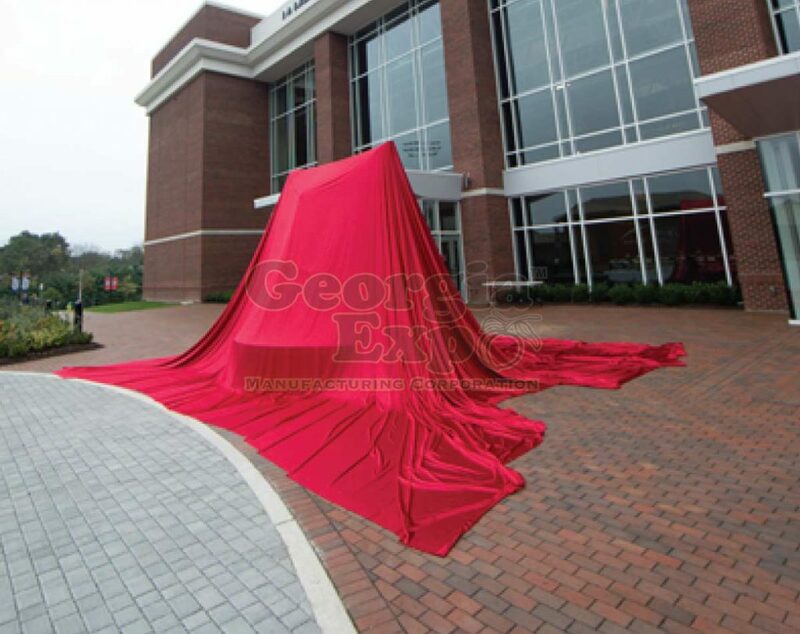 Unveiling cloths – cars, art, etc. A giant piece of our fabric is ideal for your big reveal. Any size you need, no matter how big, is something we can make for you. 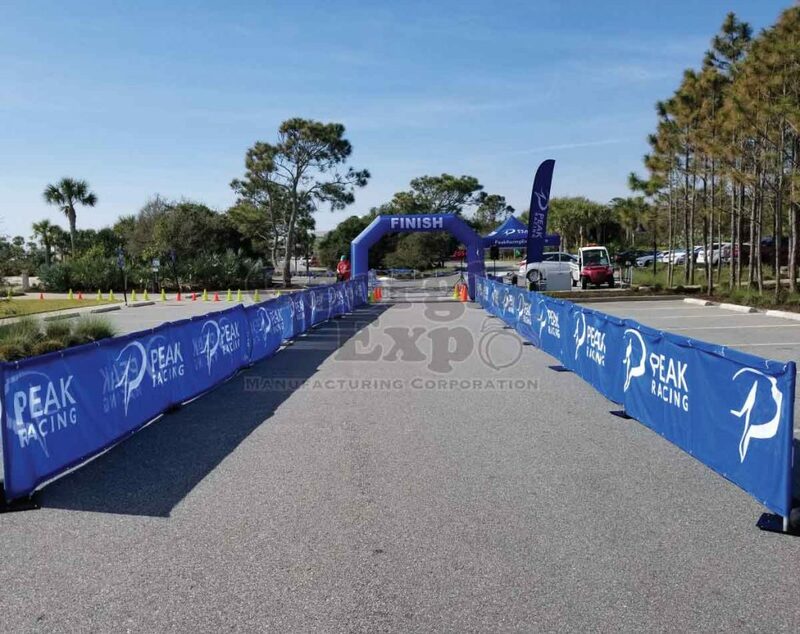 Keep all of those adoring fans from crowding the finish line of your big race by using pipe and drape to rope off the track and create the finish line shoot. The most important day of your life should also be the most beautiful. 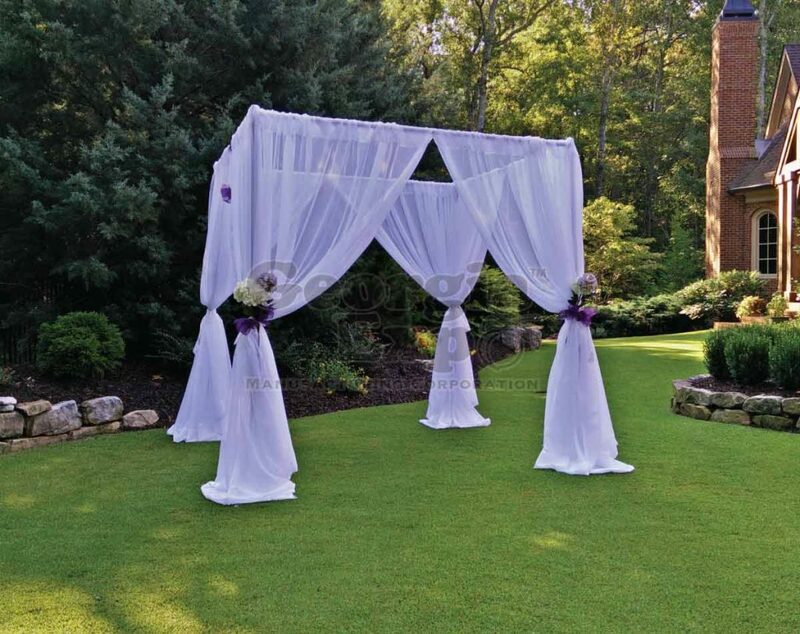 Get married under the canopy of your dreams all made possible with pipe and drape (and some flowers too!). Pipe and drape is so easy to set up making it perfect for any mobile petting zoo. Pack up your corals and take them with you every time you move on to your next event space. Making your space look sleek can be tricky with so many cords and equipment for your set up. 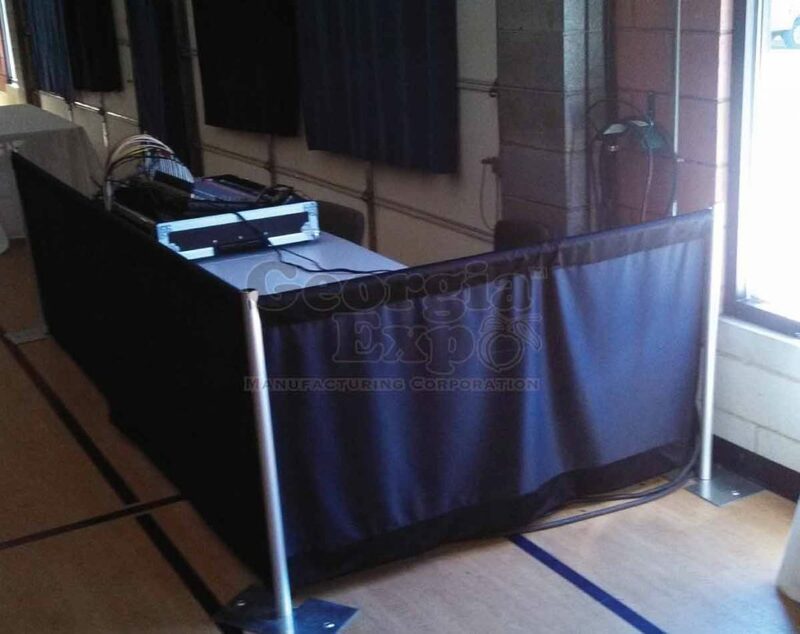 Pipe and drape is a great way to hide all of that while looking professional and put together. Display your jewelry at any event with the ease of a pipe and drape booth. 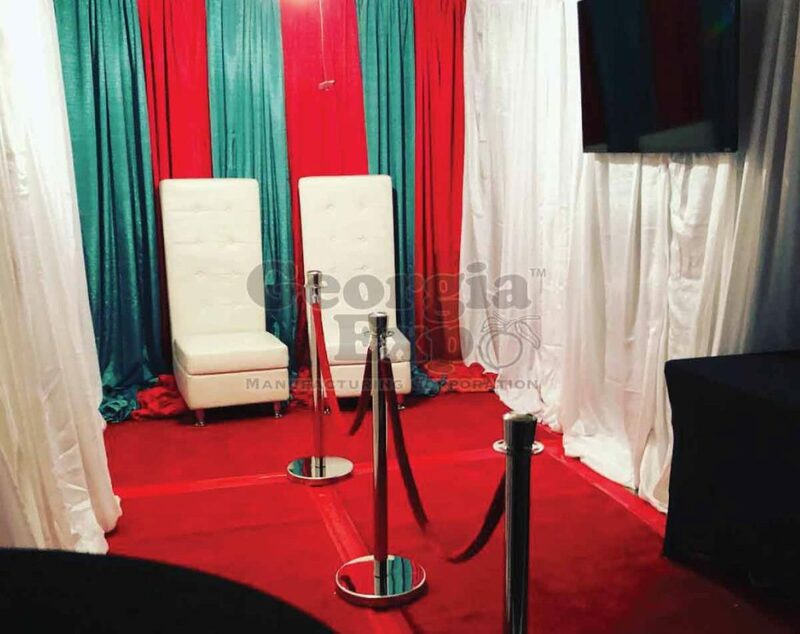 Keep your VIP area exclusive by dividing it off in luxurious Velour pipe and drape. Dividing space is what pipe and drape does best. Creating an escape room is all about how you use your space, use it however you want with the freedom that pipe and drape gives you. Set up stalls for selling the coolest products easily with pipe and drape. 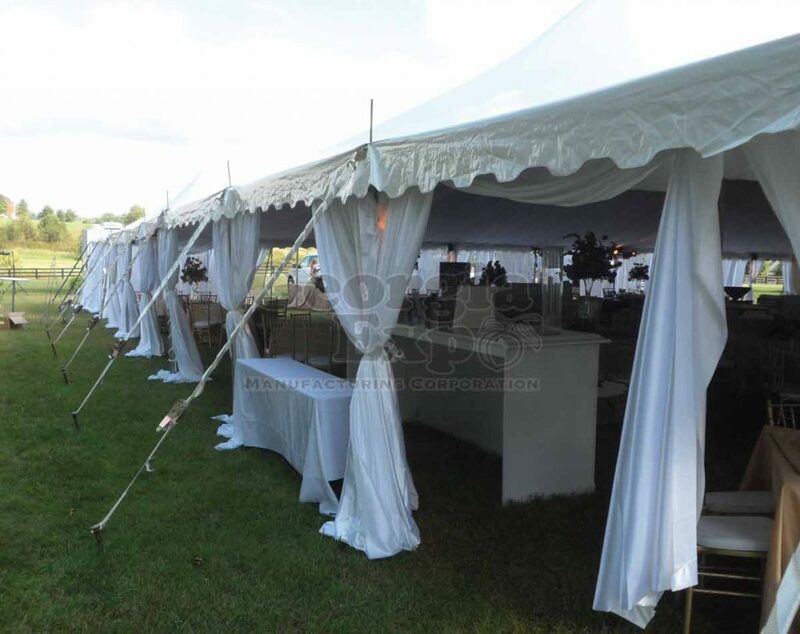 Tents are popular for outdoor events, but they don’t always look amazing on the inside. Pipe and drape can fix all of that by giving you the look and feel that you want inside your tent space. Defining space is what pipe and drape does best. Make private rooms for a confessional anywhere you’ve got space! Don’t let guests get lost inside your space anymore. Print out directional signs for them to be put up and taken down whenever you need them. 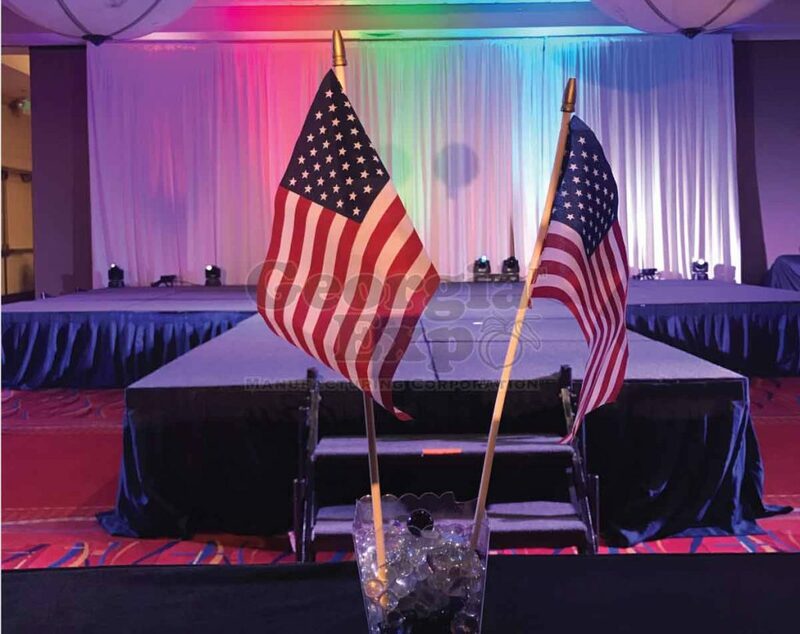 Every stage needs curtains and pipe, and drape is the perfect solution for how to put up the drape. Keep your performance looking professional with some velour or even poly knit fabric. 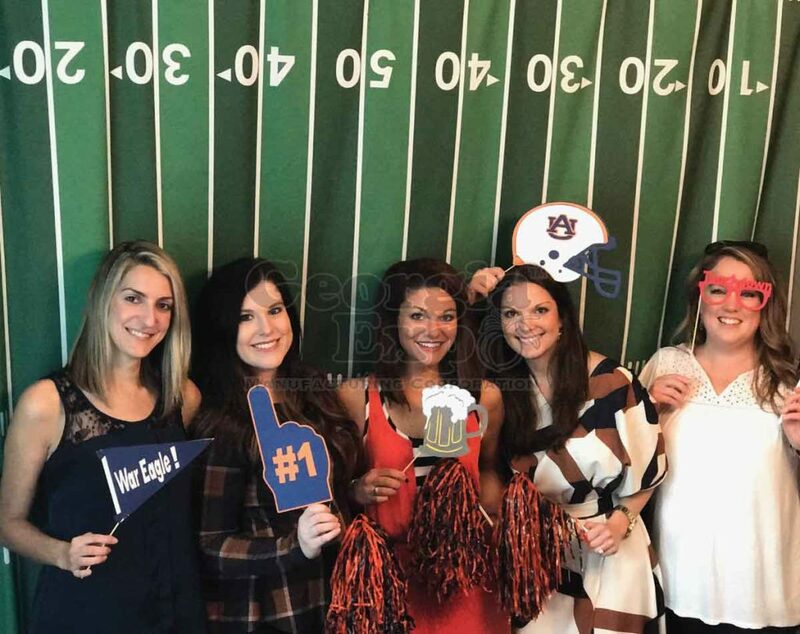 One of our favorite ways we’ve seen our customer use their pipe and drape is to mask the outside of a projector screen for an upscale viewing party. Cable management can be so difficult, but with hollow pipe it is no problem to hide all of those unsightly cords. It can be hard to sift through so many items at a garage sale but if you use your pipe and drape to display everything you have for sale so that it can be easily found and purchased. No space is too small to be transformed by pipe and drape. You can even make a small closest into the throne at the North Pole for a magical Christmas experience. Don’t worry about cleaning your room or finding a space with a good background! Mask it all with a pipe and drape backdrop. Video your tutorials without worrying about what your surroundings look like because now they can be your brand colors! Nothing is more magical than tiny lights twinkling in the sky. 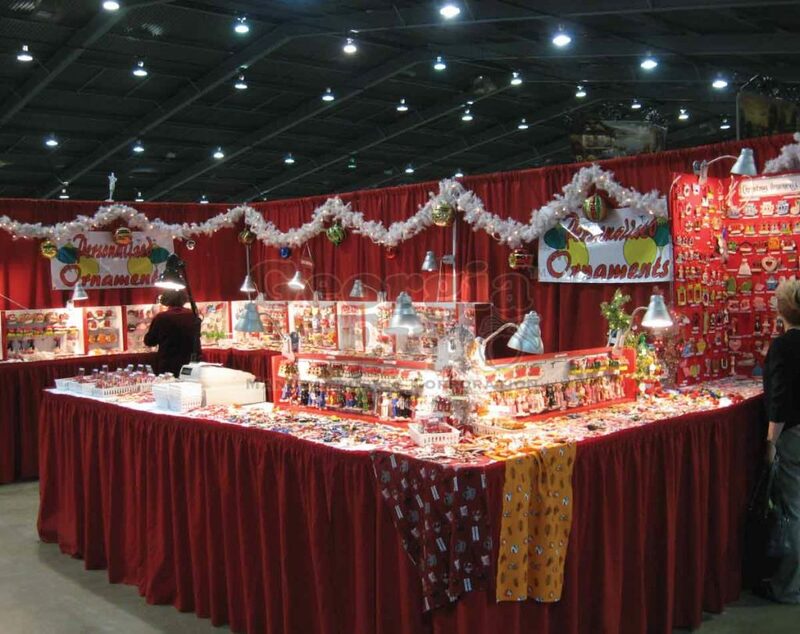 Set up your market lights in any space by stringing them on pipe and drape hardware. Balloon arches make any party feel more official, but it can be hard to figure out how to put them up. Use your base from your pipe and drape kit to weigh down your balloons in any room without your weight taking up valuable party space. Where ever your church is meeting can feel like its own space with pipe and drape walls. Create classrooms, a stage, and even a sanctuary in any room with a couple of walls of drape that can be placed anywhere. 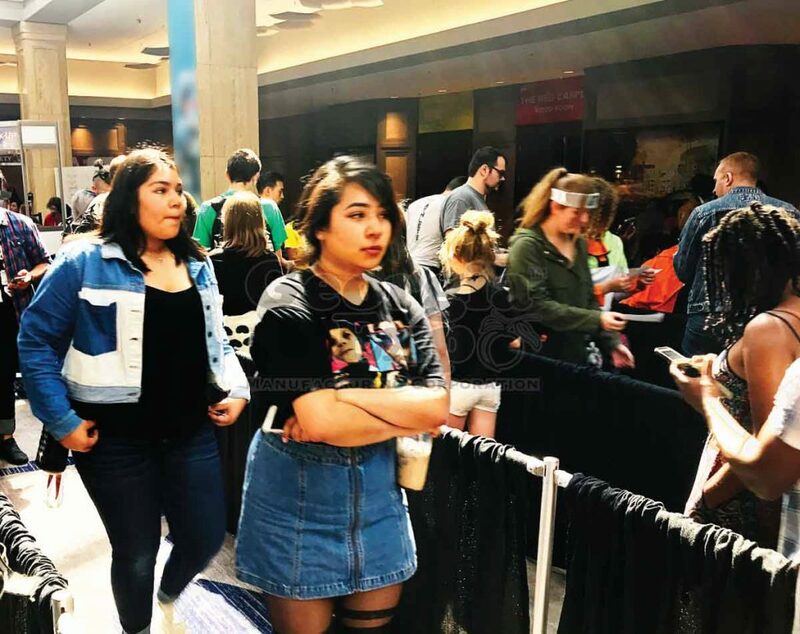 Don’t forget about the nursing moms at your event. These pop-up nursing stations can be placed anywhere and moved at a moment’s noticed providing the privacy need to take care of business. Everyone takes pictures to remember events and what a good time they had. 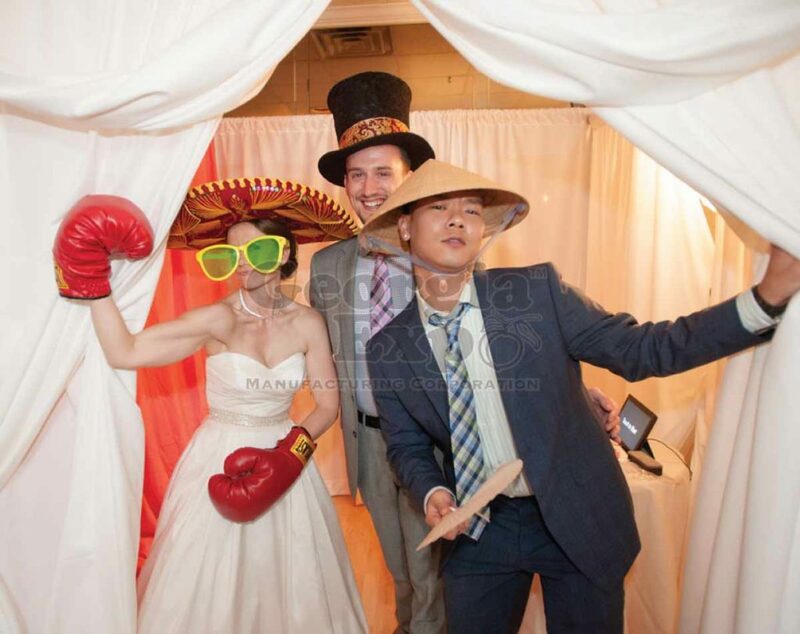 Make it easy for them with a selfie station made with a custom printed fabric backdrop. 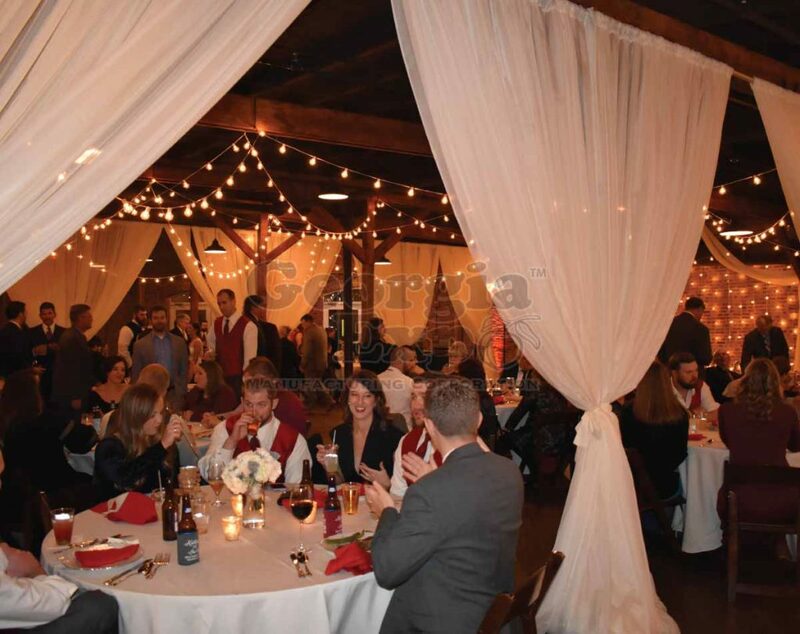 You’ve seen weddings in a barn, but have you seen an airplane hangar used as an event space? 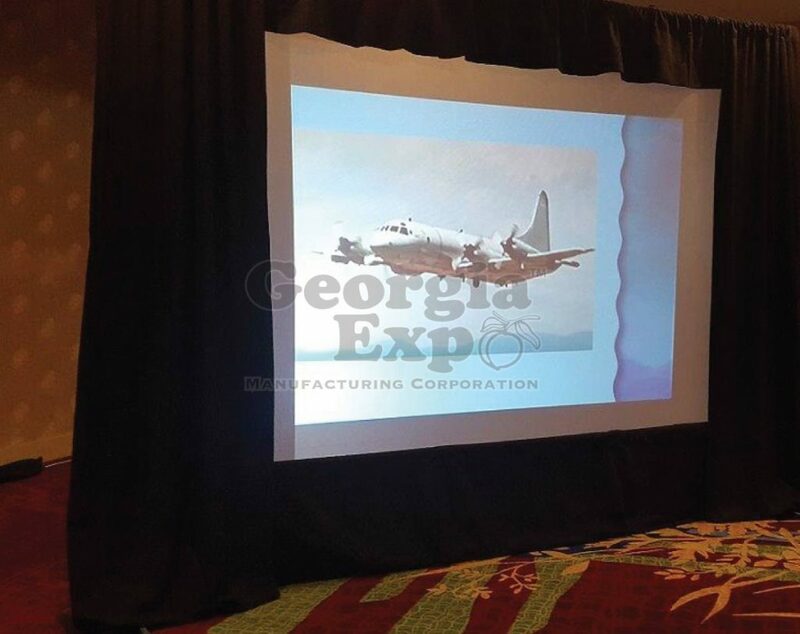 If there’s pipe and drape involved you probably can’t even tell it’s an airplane hangar, it just seems like a classy event venue in an amazing location. It may not hold in real criminals but with pipe and drape you can create a fake jail cell use in raising money for an event. 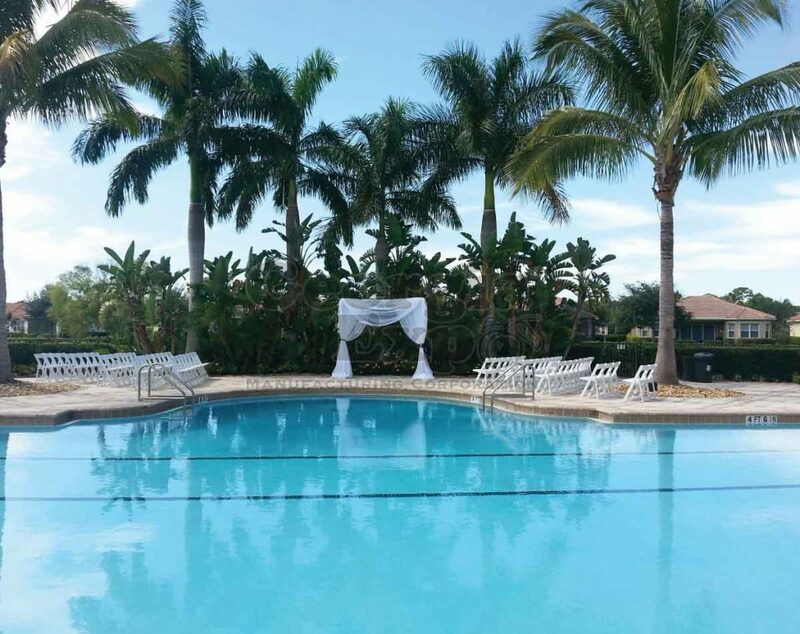 Make your wedding day everything that you’ve dreamed about with an arbor to say your vows under. Pipe makes it easy to set up and drape makes it customizable to your colors and style. If your space is too large, you can make it seem more intimate by blocking some off with pipe and drape wall. This is great for large concert halls. Pop up banners are a great way to display information quickly and easily. You can create a great set up just using a base and upright. ← Does My Drape Need To Be Flame Resistant?